The room of the Hermaphrodite has reopened with a new guest! The room 38 of the Uffizi has reopened. It is called the room of the Hermaphrodite, because of the presence of the very famous sculpture, an Imperial Age Roman copy of the Hellenistic original one, which was made in the 2nd century B.C. The life size artwork is very popular: it represents the sleeping son of Hermes and Aphrodite. The Sleeping Hermaphrodite has been in the room 38 since the first half of the 19th century. Nowadays the room is the hearth of the series of works that represents the artistic taste of Francesco I, who was Grand Duke and an important patron during the second half of the 16th century. The room was closed in 2014 because of a new set-up, due to the arrival of The Allegory of Virtue. This is a painting by Jacopo Ligozzi (1547-1627), donated by the art dealer Jean-Luc Baroni. It is likely that the painting by Ligozzi first became part of the Medici collections at the times of Francesco I. In about 1720 it was sold or ceded and, after three centuries, Baroni decided to donate it to the Uffizi Gallery in memory of his father, Giancarlo. According to Antonio Natali – the director of the Uffizi – the painting represents the intellectual and artistic climate that led to the birth of the Gallery. Also for this reason, the room was set-up with incarnadine walls, that refer to the Tribuna’s ones – the very first nucleus of the gallery – and that are similar to those in the rooms dedicated to Michelangelo and to the 16th century painting. 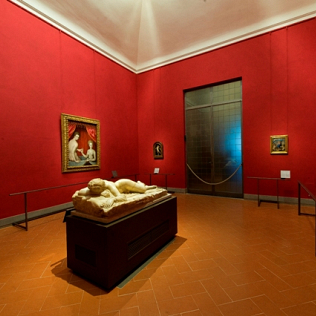 In the center of the room there is the Sleeping Hermaphrodite: the sculpture is also part of the tactile tour for visually impaired and blind people. On the walls some paintings – having reference to the environment of the court of that time – are exhibited: the Allegory of Fortune and the Allegory of Happiness, by Bronzino; the Two Women bathing, by the Fontainebleau School; a portrait of Francesco I, by a Florentine painter. Room 38 is a very important room because it represents a significant period for the Medici collections. Today it has been reopened to let us admire a new guest. The new set-up was made with the contribution of the “Friends of the Uffizi Gallery” association.